InfoCaptor is an extremely competent product, capable of addressing many BI, data visualisation and analytics needs at a very modest price. Deployment can either be in-house or on the web, and in either case the interface is browser based. This is a pragmatic, 'get-the-job-done' solution without the surface gloss and high prices charged by other suppliers. It takes under 10 mins to build your first dashboard. Drag drop visual analytics does not limit you thinking in terms of X and Y axis. Rapidly change visualizations to see data from different angles. Keep what you like and package them into published dashboards. Drag and Drop Visual Analyzer for self-service data exploration. Takes only few clicks from data to final dashboards. Enterprise user access control mechanism.Integrates with LDAP or Active Directory.Public or private dashboards. Comprehensive library from pivot tables to bars, stacks,area and scatter plots. Hierarchical visualizations such as Circle pack, Treemap, sunburst and cluster charts. Trellis and small multiples. InfoCaptor is different, Visualizations + Dashboards + Social and Web connectors. InfoCaptor is simply a web based application that works on every platform [windows, linux/unix or Mac]. Web and browser based dashboard designer and bi tools are a must to establish a firm data-driven culture. Why spend thousands of dollars on each desktop license and then millions of dollars on server licenses? Compared to other vendors like Tableau or Qlikview, InfoCaptor is extremely affordable. No SQL knowledge necessary. No Technical skills needed. Wow, This tool has amazing capabilities! InfoCaptor is a very good Dashboard Software, you should try it!! 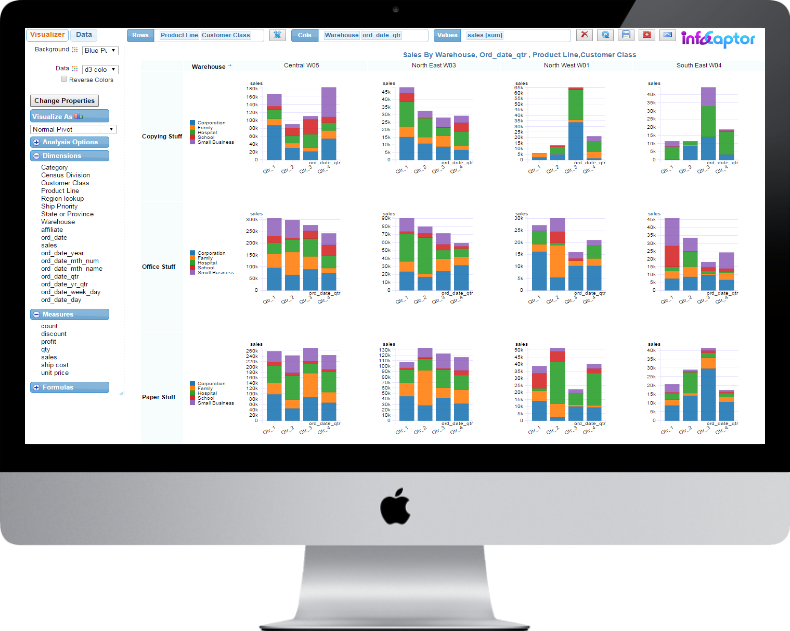 Whether you are looking to create simple excel dashboard or web based executive Dashboard or you are simply looking for free style data visualizations, InfoCaptor does it all in an extremely easy and visually interactive way. My organization was looking for a way to chart MyQSL data on our website. One of the requirements was to use something that didn't require extensive coding or multiple js files to run. InfoCaptor fit the bill. The programmer interface is similar to Microsoft's Power BI and is quite easy to navigate once you get the hang of it. With that said, where InfoCaptor really shines is it's commitment and support for their customers. The customer support team walked me through the installation and configuration of the product, and was critical in helping me code some of our trickier SQL scripts. They saved the day on more than one occasion. Our new site will launch in a few months and InfoCaptor charts will be a major component. We couldn't be happy with our decision to become a client. Since 2015, we have been engaged InfoCaptor to host, develop and manage our AnayticRx data analytic solutions for four behavioral health providers and Veterans Leadership of Western PA. InfoCaptor has integrated Qualifacts, Netsmart and Best Notes EHR's directly into AnalyticsRx to provide and array of Outcomes, Quality, Productivity and Compliance dashboards (~40). Before InfoCaptor I had to manually paste up reports each time I wanted to see how my sales staff was trending against goals and last year's sales. Now I have a realtime dashboard that lets me know who is performing and who is not. That allows me to be more proactive.